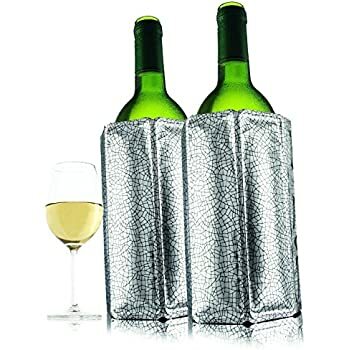 Amazon's Choice for "wine cooler sleeve freezer"
Keep In freezer and you're ready to chill wine in minutes! 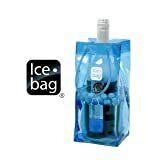 We needed to buy another of these for keeping more bottles chilled. The previous ones are still going strong at ~3 years. 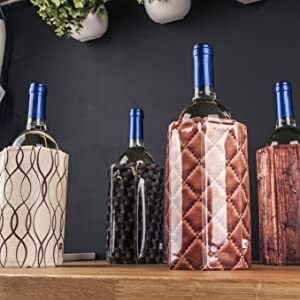 For ensuring your white/rose wine remains chilled, as part of a picnic or event, and for quickly chilling a little more than the fridge this is a good solution. 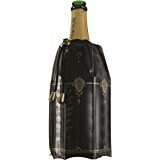 We've not seen much benefit keeping the cooler sleeve in the freezer beyond about 2 hours; this will keep a bottle chilled for 1-3 hours depending on the ambient temperature. At about 80 degrees outside it lasts longer than the bottle contents usually do. Although this is not the most attractive solution, it is not completely unattractive. 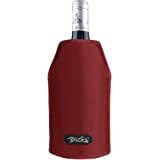 There is enough strength to the pvc material that it wears well being added / removed to the wine bottles - note, this fits the regular size (750ml) bottles snugly. Just remember not to force the sleeve on the bottle and they last much longer. 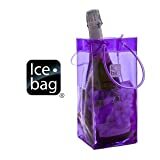 For larger bottles, including champagne bottles, we use and recommend these: Rapid Ice Champagne Cooler. If you like your bubbles you definitely want both. If this review was helpful, please mark it as so to help others find it. If it wasn't helpful, feel free to mark it so, though I'd appreciate any constructive feedback on how it could be more helpful for you and others. Feel free to ask any other questions not stated here. I've had two of these in my freezer for 15 years, and they still work wonderfully well. 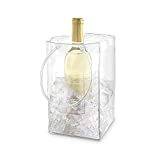 I've given numerous others as gifts, sometimes to good friends so that when I go to their house, and they're serving white wine, I don't have to drink it too warm If your bottle of wine is at room temperature, it will take a good 20 minutes to chill it. 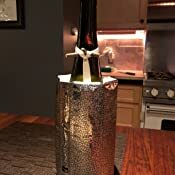 If it's already cold, it will keep it at the right serving temperature -- about 40F -- for an hour or two at least -- most bottles don't last longer than that at my house! 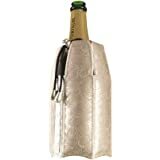 I've also bought some to fit champagne bottles -- those work well too. We love these items when we do picnics at wineries. 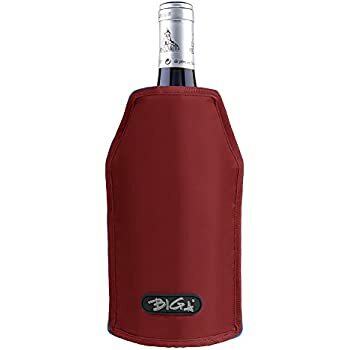 We bring it in a cooler with some ice packs and when we arrive at the winery and purchase our bottle, we slip this baby over it and it keeps the bottle cold the whole time we are picnicking, even in hot weather. 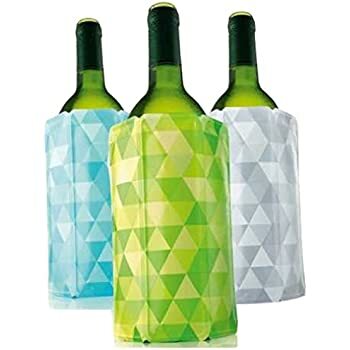 I think they are designed for helping a bottle get cold faster, which it works well at too. 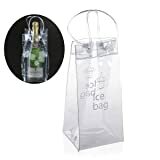 We also use it if we are bringing a bottle of white wine to a party. When you arrive, it's still as cold as it was when you took it out of the fridge. Kind of strange that there are different prices on different colors. We just went with the green grapes since it was the cheapest, it's just as attractive as the others and does the job. I have to say I was skeptical that it could chill wine as fast as it claims to. But it actually does. I bought one for my mom and she loved it so much that I bought one for myself. 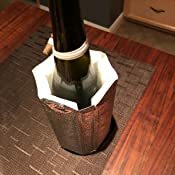 I would say that it takes about 20 minutes for the wine to get to the perfect temperature (assuming you start from a cold bottle). If you put it on a cold bottle I would say that it will last you a few hours (but lets be honest no bottle will last that long). 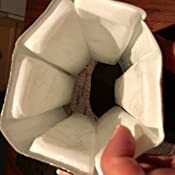 It folds flat so it can fit in even the smallest freezer space. 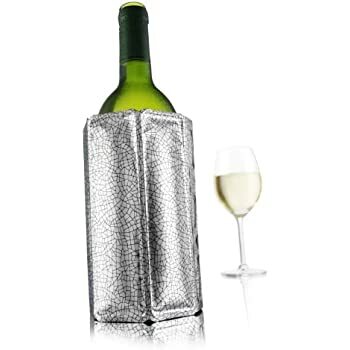 I consider this a "must" if you want to leave a bottle of wine out and keep it cold at the same time. 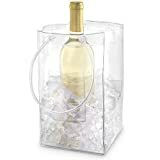 It works just as well as a wine ice bucket but is a lot cheaper and less cumbersome. 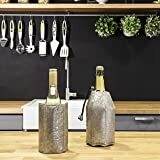 5.0 out of 5 starsThat Vacu vin wine and soda bottle coolers. I bought these about eight years ago. 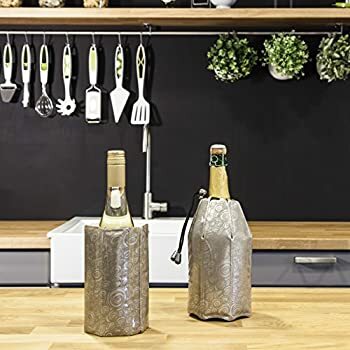 I use them all the time to keep Bottles of seltzer cold or to keep wine bottles cold. As they started wearing out I was looking to buy more. I couldn’t find them anywhere. I had originally found them in bed bath and beyond but they no longer carry them. 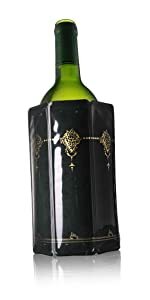 Then I noticed that the name that Vacu vin was still on it.So I looked on Amazon.com. And found them. They had them in different sizes so I bought all sizes. I keep them in my freezer and whenever I want something cold I just put them on. I absolutely love them. I bought this a few months ago a spring/summer anticipation buy, Used it a couple of times. Takes a bit of finagling to get the wine bottle in when the cooler is frozen. Didn't find it chilled a bottle down from room temp quickly. Found it more useful to keep the bottle cool once it was adequately chilled. Hopefully will be ok in the summertime to keep the bottle cool when eating outside. Will see. 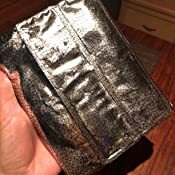 I think there are better products out there but this is ok and will use it. 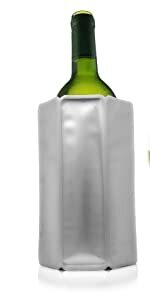 Will cool a bottle of red wine to proper drinking temperature in 20 minutes. 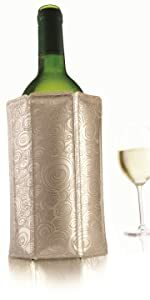 Great if you do not have a working wine cooler. 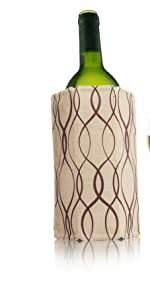 Works great on a standard burgundy wine bottle but may not completely cover some pinot noir bottles. 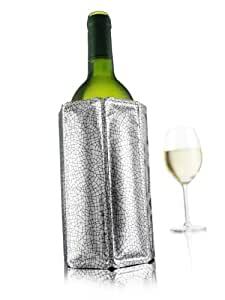 It may not bring a bottle of white wine to drinking temperature if it was rather warm. It does keep it cool for 2-3 hours if chilled before hand. This is my second sleeve after purchasing one several years ago. 3.0 out of 5 starsEasy to use, just didn't stay cold very long! 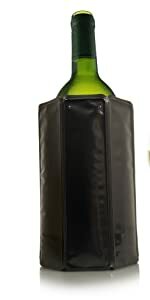 Wanted this for our summer wine festival weekends to keep whites cold or just cool down those reds in the summer heat. 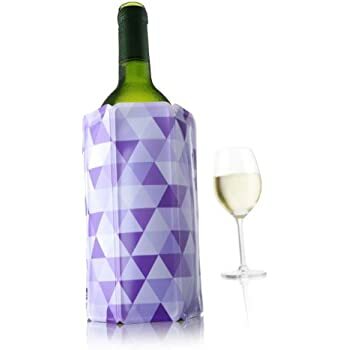 I like the ease and packable part of product, but just didn't keep wine cold. Will use but wouldn't purchase again.